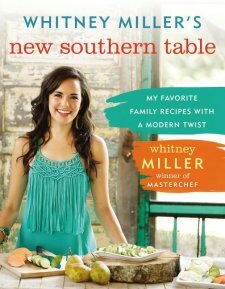 Whitney Miller is a Masterchef winner and this is her follow up book. I actually had never heard of her prior to picking up this book, so I haven't actually seen her first cookbook. The cover design is really well done, I have a hard cover which has the dust sheet cover over a hardback plain cover book underneath. Just flicking through the book initially I was very impressed by the density of this book - this is really full of a LOT of recipes! The layout of the pages is clear and easy to read however the font is quite small - smaller than average I would say. Most of the recipes are illustrated but not all. I have to add from a graphic design point of view, this book is designed really well - I love the page layouts and color theming choices throughout also. Breakfast, Social and Snacks, Soups/Salads and Sandwiches, Sides to Share, Family Suppers, Sunday Dinners, Company's Comin', Somethin' Sweet, Essentials and Enhancers. Each of the above sections is announced with it's own page and on the back is a list of all the recipes in that section. They don't include page numbers but are in the right order that you will find them after that cover page. It includes family photos throughout also and anecdotes from Whitney's life and her Southern influence. Reading through the recipes they are fairly straight forward, easy recipes with common household ingredients. This appeals to me as it means I can make something as I'm inspired to make it and not have to wait for a trip to the supermarket. She actually follows the introduction with a page listing the contents of her pantry - i.e. what is common in her home to make all of these things - that is a handy reference also. I have tried the Olive Oil Biscuits and Tomato Gravy today. I just received the book today and made them straight away as I was intrigued. The recipes both were very easy to follow and quick to make. lot of Southern style cooking which I find very heavy. The biscuits did rise well and the olive oil gave a nice crisp to them, and the gravy turned out as it should but my husband and I just weren't fans of it. For me the sauce is too gluggy and thick and needs more spices and flavors - but then it wouldn't be Southern style would it? Maybe it's not recipe but more the style of food is not something we like or are not accustomed to? (aside from fried chicken of course!). I am keen to try the Baked Apple Hand pies and the smashed potatoes and several other recipes that stand out and I will update here once I have made my way through more of the recipes. A lot of the recipes in their sound amazing like the Pulled Pork Nachos, Brownie Cookies, Fried Chicken, Chicken Parmesan Meatballs to name a few. Right now as to whether I recommend this cookbook or not, I am on the fence as my first two recipes were not hits for me, however I will be giving some other recipes a try and will update as soon as possible. Today I made the Baked Apple Hand Pies. I followed all the instructions exactly. My olive oil dough didn't make the 13 she said she gets out of it - not sure why as it was all exact but anyway I got 7 pies. The olive oil pastry was quick and easy to make - in fact the whole recipe was very straight forward which is a great thing about this book as well as the fact all the ingredients I already had on hand - nothing out of the ordinary. Like she says the pastry has a very light crispiness to it. The apple filling was nice. Yet again I hate to say I'm not blown away with this recipe and I wouldn't make it again. It's just ok. I can taste the olive oil flavor in the pastry which may not be an issue for some but for me I'm a butter girl and love the taste of butter in cooking - that ruined the overall flavor for me.. I'm not sure if I want to try any more recipes as everything I've tried so far has not really impressed me at all. I might try the skillet corn and then be done with the book... so we'll see if the skillet corn impresses me enough to inspire trying more from that book. Please note: Booklook sent me a copy of this book for my review however the opinions expressed here are entirely my own.